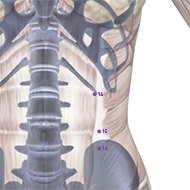 Spleen Meridian / Channel Acupuncture Points. -It governs “transportation and absorption” (运化, Pinyin: yùn-huà), i.e. the extraction of jīng weī (精微, lit. “essence bits”, usually translated with food essence, sometimes also called jīng qì [精气, essence qi]) – and water – from food and drink, and the successive distribution of it to the other zàng organs. -It is called the “root of the postnatal” (后天之本, Pinyin: hoùtiān zhī běn]) – as opposed to the congenital qì, which is stored by the Kidney zàng. The Spleen absorbs jīng weī from the food after it has been preprocessed by the Stomach and the Small Intestine, and then distributes it to the whole body, especially upwards to the Lung and Heart, where jīng weī is transformed into qì and xuě (blood).5 -It distributes the water extracted from the food and distributes it to the whole of the body, especially to the Lung and Kidney zàng, and thus assists the body’s water metabolism. -It contains (统, Pinyin: tǒng) the blood inside the vessels and governs muscles and limbs. This meridian contains 21 acupoints in one side, that is 42 acupoints in total. Location: On the medial side of the great toe, 0.1 cun posterior to the corner of the nail. Indications: Abdominal distension, bloody stools, menorrhagia, uterine bleeding, mental disorders, dream disturbed sleep, convulsion. Acupuncture Method: Puncture subcutaneously 0.1 inch. Moxibustion is applicable. Vasculature: The dorsal digital artery. Innervation: On the anastomosis of the dorsal digital nerve derived from the superficial peroneal nerve and the plantar digital proprial nerve. Indications: Abdominal distension, gastric pain, constipation, febrile diseases with anhidrosis. Acupuncture Method: Puncture perpendicularly 0.1-0.3 inch. Moxibustion is applicable. Vasculature: The branches of the medial plantar artery and vein. 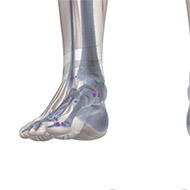 Innervation: The plantar digital proprial nerve derived from the medial plantar nerve. Location: Proximal and inferior to the 1st metatarsophalangeal joint, in the depression of the junction of the red and white skin. Indications: Gastric pain, abdominal distension, constipation, dysentery, vomiting diarrhea, borborygmus, sluggishness, beriberi. Vasculature: The dorsal venous network of the foot, the medial plantar artery and the branches of the medial tarsal artery. Innervation: The branches of the saphenous nerve and superficial peroneal nerve. Location: In the depression distal and inferior to the base of the first metatarsal bone, at the junction of the red and white skin. Vasculature: The medial tarsal artery and the dorsal venous network of the foot. Innervation: The saphenous nerve and the branch of the superficial peroneal nerve. 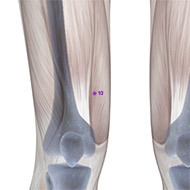 Location: In the depression distal and inferior to the medial malleolus, midway between the tuberosity of the navicular bone and the tip of the medial malleolus. Indications: Abdominal distension, constipation, diarrhea, borborygmus, pain and rigidity of the tongue, pain in the foot and ankle, hemorrhoid. Vasculature: The medial tarsal artery and the great saphenous vein. Innervation: The medial crural cutaneous nerve and the branch of the superficial peroneal nerve. 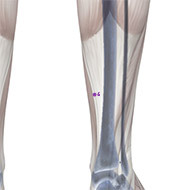 Location: 3 cun directly above the tip of the medial malleolus, posterior to the medial border of the tibia. Indications: Abdominal pain, borborygmus, abdominal distension, diarrhea, dysmenorrhea, irregular menstruation, uterine bleeding, morbid leukorrhea, prolapse of the uterus, sterility, delayed labour, nocturnal emission, impotence, enuresis, dysuria, edema, hernia, pain in the external genitalia, muscular atrophy, motor impairment, paralysis and pain of the lower extremities, headache, dizziness and vertigo, insomnia. Acupuncture Method: Puncture perpendicularly 0.5-1.0 inch. Moxibustion is applicable. 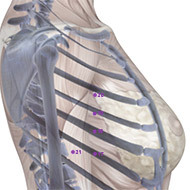 Acupuncture on this point is contraindicated in pregnant women. Vasculature: The great saphenous vein, the posterior tibial artery and vein. Innervation: Superficially, the medial crural cutaneous nerve; deeper, in the posterior aspect, the tibial nerve. 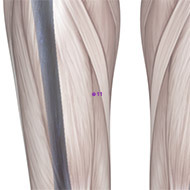 Location: 6 cun from the tip of the medial malleolus, on the line connecting the tip of the medial malleolus and Yinlingquan (SP-9), posterior to the medial border of the tibia. Indications: Abdominal distension, borborygmus, coldness, numbness and paralysis of the knee and leg. 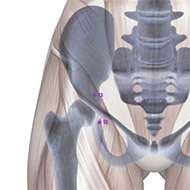 Regional anatomy: See Sanyinjiao (SP-6). Location: 3 cun below Yinlingquan (SP-9), on the line connecting Yinlingquan (SP-9) and the medial malleolus. Indications: Abdominal pain and distension, diarrhea, edema, dysuria, nocturnal emission, irregular menstruation, dysmenorrhea. Vasculature: Anteriorly, the great saphenous vein and the branch of the genu suprema artery; deeper, the posterior tibial artery and vein. Location: On the lower border of the medial condyle of the tibia, in the depression posterior and inferior to the midial condyle of the tibia. Indications: Abdominal pain and distension, diarrhea, dysentery, edema, jaundice, dysuria, enuresis, incontinence of urine, pain in the external genitalia, dysmenorrhea, pain in the knee. Vasculature: Anteriorly, the great saphenous vein, the genu suprema artery; deeper, the posterior tibial artery and vein. Innervation: Superficially, the medial crural cutaneous nerve; deeper, the tibial nerve. 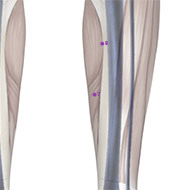 Location: When the knee is flexed, the point is 2 cun above the mediosuperior border of the patella, on the bulge of the medial portion of m. quadriceps femoris. Or when the patient’s knee is flexed, cup your right palm to his left knee, with the thumb on the medial side and with the other four fingers directed proximally, and the thumb forming an angle of 45° with the index finger. The point is where the tip of your thumb rests. Indications: Irregular menstruation, dysmenorrhea, uterine bleeding, amenorrhea, urticaria, eczema, erysipelas, pain in the medial aspect of the thigh. Vasculature: The muscular branches of the femoral artery and vein. Innervation: The anterior femoral cutaneous nerve and the muscular branch of the femoral nerve. Location: 6 cun above Xuehai (SP-10), on the line drawn from Xuehai (SP-10) to Chongmen (SP-12). 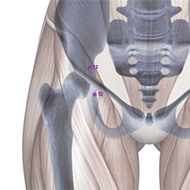 Indications: Dysuria, enuresis, pain and swelling in the inguinal region, muscular atrophy, motor impairment, pain and paralysis of the lower extremities. Vasculature: Superficially, the great saphenous vein; deeper on the lateral side, the femoral artery and vein. Innervation: The anterior femoral cutaneous nerve; deeper, the saphenous nerve. Location: Superior to the lateral end of the inguinal groove, lateral to the pulsating external iliac artery, at the level of the upper border of symphysis pubis, 3.5 cun lateral to Qugu (CV-2). Indications: Abdominal pain, hernia, dysuria. Acupuncture Method: Avoid puncturing the artery. Vasculature: On the medial side, the femoral artery. 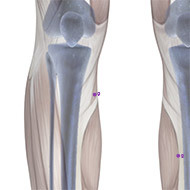 Innervation: Just where the femoral nerve traverses. 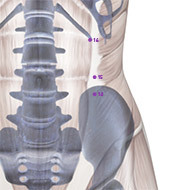 Location: 4 cun below the centre of the umbilicus, 0.7 cun superior to Chongmen (SP-12), 4 cun lateral to the anterior midline. Indications: Lower abdominal pain, hernia. 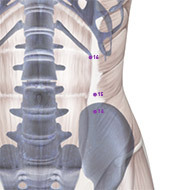 Location: 1.3 cun below Daheng (SP-15), 4 cun lateral to the anterior midline, on the lateral side of m. rectus abdominis. Indications: Pain around the umbilical region, abdominal distension, hernia, diarrhea, constipation. Vasculature: The eleventh intercostal artery and vein. Innervation: The eleventh intercostal nerve. Location: 4 cun lateral to the center of the umbilicus, lateral to m. rectus abdominis.. Indications: Abdominal pain and distension, diarrhea, dysentery, constipation. 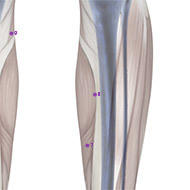 Acupuncture Method: Puncture perpendicularly 0.7-1.2 inches. Moxibustion is applicable. Vasculature: The tenth intercostal artery and vein. Innervation: The tenth intercostal nerve. 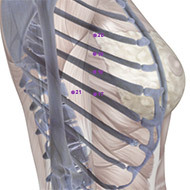 Location: 3 cun above the centre of the umbilicus, and 4 cun lateral to the anterior midline. Indications: Abdominal pain, indigestion, constipation, dysentery. Vasculature: The eighth intercostal artery and vein. Innervation: The eighth intercostal nerve. Location: In the 5th intercostal space, 6 cun lateral to the anterior midline. Indications: Fullness and pain in the chest and hypochondriac region. Innervation: The lateral cutaneous branch of the fifth intercostal nerve. Location: In the 4th intercostal space, 6 cun lateral to the anterior midline. Indications: Fullness and pain in the chest and hypochondrium, cough, hiccup, mastitis, insufficient lactation. Vasculature: The branches of the lateral thoracic artery and vein, the thoracoepigastric artery and vein, the fourth intercostal artery and vein. Innervation: The lateral cutaneous branch of the fourth intercostal nerve. Location: In the 3rd intercostal space, 6 cun lateral to the anterior midline. Vasculature: The lateral thoracic artery and vein, the third intercostal artery and vein. Innervation: The lateral cutaneous branch of the third intercostal nerve. 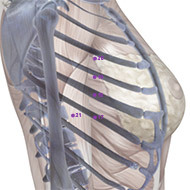 Location: In the 2nd intercostal space, 6 cun lateral to the anterior midline. Indications: Fullness in the chest and hypochondriac region, cough, hiccup. Vasculature: The lateral thoracic artery and vein, the second intercostal artery and vein. Innervation: The muscular branch of the anterior thoracic nerve, the lateral cutaneous branch of the second intercostal nerve. 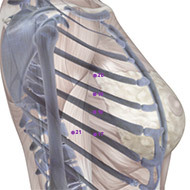 Location: On the lateral side of the chest and on the middle axillary line, in the 6th intercostal space. Indications: Pain in the chest and hypochondriac region, asthma, general aching and weakness. Vasculature: The thoracodorsal artery and vein, the seventh intercostal artery and vein. 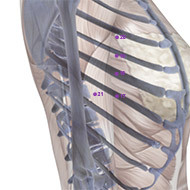 Innervation: The seventh intercostal nerve and the terminal branch of the long thoracic nerve.